Our mission at Haws Family Dentistry is to provide you with a healthy and beautiful smile. 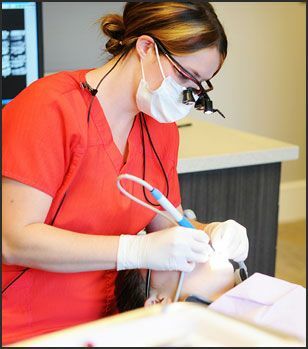 Within the walls of our practice, we will do everything necessary to best serve your dental health. Although our services can help you walk out of our office with a healthier and brighter smile, regular dental visits cannot substitute for the consistent hygienic maintenance that you should do in the home. Dr. Jayson C. Haws and our dental team are happy to instruct our patients in proper dental hygiene in Brigham City, Utah. Brush at least twice a day to remove plaque formed from meals eaten throughout the day. Make sure to brush the outer and inner surfaces of each tooth. Floss at least once a day to help clean spaces between your teeth and disrupt plaque colonies from building up, in order to prevent damage to the gums, teeth, and bone. Rinse your mouth with water after brushing and after meals if you are unable to brush. If you implement these practices in your daily life and participate in regularly scheduled visits to our office, you will be rewarded with a beautiful and healthy smile. Proper dental hygiene will keep you from unnecessary pain and discomfort, increase your confidence, and give you a smile that will last a lifetime. When you come to our practice, you may also be given special instructions to help you with any specific treatments that we suggest to improve your dental health. If you have any questions, please contact Haws Family Dentistry to let us know how we can help you maintain optimum oral hygiene and to schedule a visit with our dentist.